What are the laws regarding speeding in Las Vegas, Nevada? Can I fight a Las Vegas speeding ticket? Is it possible to get the speeding ticket dismissed? Will I receive points on my license? Do Nevada speeding tickets affect insurance rates? Does Nevada require traffic school for speeding tickets? Can I just forget about my ticket? Will a ticket make me lose my commercial driver’s license? What about out-of-state licenses and Las Vegas speeding tickets? Is it possible to “seal” a Nevada speeding ticket after conviction? Should I pay or fight my traffic ticket? Should I fight my speeding ticket in a trial? Should I hire a Las Vegas Traffic Ticket Attorney? Speeding is considered a misdemeanor moving violation. You could also face reckless driving charges, which could be better handled by a traffic ticket lawyer. While it is always best to stay within the posted speed limit on any road, there are some circumstances where drivers should take extra precautions by driving slower. Officers from the Nevada State Highway Patrol and the Las Vegas Metro police department may monitor school zones and road construction work areas more than average regions of roadways due to the safety risks. It is unlawful to drive at any rate over the posted speed limit, which will never be more than 80 miles per hour. It is illegal to drive at a speed that is greater than 80 miles per hour. Drivers must take into account the weather, road conditions, and amount of traffic to avoid driving at an unreasonable rate of speed. It is unlawful to drive at any rate of speed that could potentially result in property damage, injury, or death. If you get pulled over and receive a speeding ticket, a qualified traffic ticket lawyer can help to determine if there is anything that you can do to reduce or even possibly avoid the penalties that you may face. In the state of Nevada, each county and city has its own fine scale that is based on how many miles per hour over the posted limit that you were driving when you were pulled over for speeding. In the city of Las Vegas, you will generally be fined $205 for speeding. In the city of Reno, you can be fined anywhere from $115 to $220, depending on how fast over the posted limit you were driving. The Nevada DMV will also impose demerit points against your license. You can check the regulations for your jurisdiction or you should speak with a traffic ticket attorney to find out the specific fines that can be levied against you in your city or county. Fines can be doubled if you are caught speeding in pedestrian safety, school, and work zones. These zones are clearly marked. Because of the additional fines, you might wish to consult with a skilled traffic ticket attorney to discuss your options. There are times when driving slightly over the posted limit in Nevada is a simple infraction and not a moving violation. If you are speeding slightly on a rural road during daylight hours, you can be fined $25 and receive no demerit points against your driver’s license. However, you can only be driving up to 10 miles per hour over the posted speed if it is listed at 60 to 65 miles per hour and 5 miles per hour over if the posted speed is 70, 75, or 80 mph. These rules may not apply in certain counties. In any of these circumstances, a good traffic ticket lawyer in Las Vegas might be able to provide a defense. Witness testimony, video evidence, and investigation by your traffic ticket attorney might be enough to have your speeding case dropped from a moving violation to a simple infraction. It is possible to have a speeding ticket reduced or dismissed in Las Vegas, Nevada, especially if you get help from an experienced traffic ticket attorney. However, if you have an extensive history of receiving tickets, have a lot of demerit points on your driver’s license, or if you have serious criminal history, you might not be able to have your speeding ticket dismissed. In these cases, you might want to obtain the advice or assistance of a traffic ticket attorney. As a misdemeanor moving violation in Las Vegas, Nevada, speeding will result in a set number of demerit points being issued to your driver’s license. The number of points that you receive is based on the number of miles over the set speed limit that you were driving. If speeding resulted in a reckless driving charge, you will face 8 demerit points being placed on your driver’s license. Because your license will be suspended if you reach 12 points, it can be imperative to allow a traffic ticket lawyer to represent you in front of the judge. Points that you accrue on your license for a moving violation in Las Vegas, Nevada, will stay on your license for a full year. It is important that you do not allow points to build up too much that you lose your driving privileges. Working with a traffic ticket attorney may save you from accruing points that could affect your ability to drive in the state of Nevada. As a moving violation, a speeding ticket can really affect your insurance rates. Your premiums will generally go up even if the change is not noted right away. This is because insurance providers will typically check on the status of your driver’s license for any new points or suspensions. Getting an experienced traffic ticket lawyer to represent you in court can help to reduce the speeding charges to a non-moving violation, which will usually not affect your insurance rates. In certain cases, traffic school may be ordered as a part of the sentence that you receive for speeding. This is usually reserved for those who are caught driving at an incredibly high rate of speed. While you may not be ordered to attend traffic school, you may choose to do so within 5 days of a guilty plea on your Nevada speeding ticket In these cases, you might be able to have your speeding offense lowered to a non-moving violation. If you have between 3 and 11 points on your license, you can attend traffic school to have 3 points removed. You can discuss the matter with your traffic ticket attorney. If you do not pay your speeding ticket by the due date or if you do not show up for your scheduled court hearing, the judge will issue a bench warrant. Although police officers in Las Vegas, Nevada, may not go out of their way to serve you with a bench warrant for speeding, you can be arrested for such a warrant if you are pulled over for another moving violation or any other reason. This is why it can be important to talk with a knowledgeable traffic ticket lawyer before you decide to ignore your ticket. If you missed your court date or did not pay your fines on time, you may need to hire a traffic ticket attorney to help you to resolve the warrant and any other penalties that you might face as a result of ignoring a speeding ticket. The same demerit point system is used for those with a CDL as for regular drivers. However, if you drive 15 miles per hour or faster over the posted speed in Las Vegas, Nevada, this is considered a serious offense. If you receive two serious offense moving violations within a certain time frame, your CDL may be suspended. You have an obligation to notify your employer of any moving violation you are charged within a timely manner. You will have fines that you must pay to the court in Las Vegas, Nevada. Because each state has its own demerit point system, you will most likely receive points based on a speeding offense in your home state. You should consult with a traffic ticket attorney from your state to learn more. You will have to wait for a full year following your conviction to begin the record-sealing process. If your case is dismissed or if you are acquitted, you can begin the process of sealing immediately. This process may go more smoothly with the help of a qualified traffic ticket lawyer. Because a speeding ticket can result in fines, demerit points, a criminal record, and increased insurance rates, it might be beneficial to find an experienced traffic ticket attorney to help you to have your ticket dismissed or at least reduced to a non-moving violation. Because speeding is a misdemeanor moving violation, you may be able to have a trial before a judge. This is called a bench trial. You cannot go before a jury for this type of offense. Most speeding cases do not go to trial. Rather, the defendant’s traffic ticket attorney and the prosecution will generally come to an agreement outside of a trial. 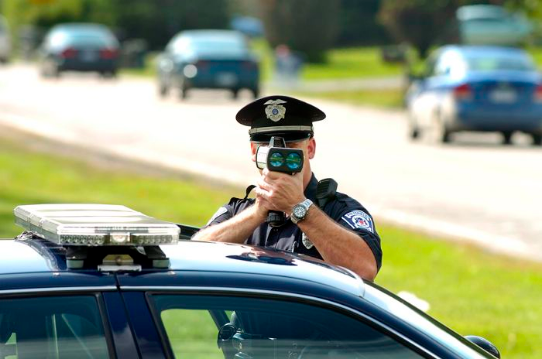 If you plan on fighting your speeding ticket, it is important that you understand the process. You can increase your chances of having a successful outcome by finding the right traffic ticket attorney in Las Vegas, Nevada, to help get your charges reduced or even dismissed. Have you received a traffic citation for speeding while driving in Nevada? Our attorneys at Fix Your Tickets can help you get tickets reduced or even thrown out. For a FREE consultation contact Las Vegas Criminal Defense Attorney Bennair Bateman at 702-605-0505. In many cases, we can get your traffic tickets reduced to a non-moving violation or dismissed with no need for traffic school, and zero demerit points on your driving record.